Karin Kessler and her typewriter inventory at Backspace Westport LLC in Westport. When walking into Karin Kessler’s new store Backspace Westport, those of a certain age could easily get the feeling of stepping back in time. And those of a younger age might certainly be baffled at the products on display: typewriters. “From the 1890s to the 1980s, typewriters were part of everyone’s life,” said Kessler, a former registered dietician who transitioned back from years as a stay-at-home mom to a retailer with an esoteric inventory. Kessler came to typewriters a few Christmas seasons back when she opted to give her teenage children an alternative gift to electronic devices. 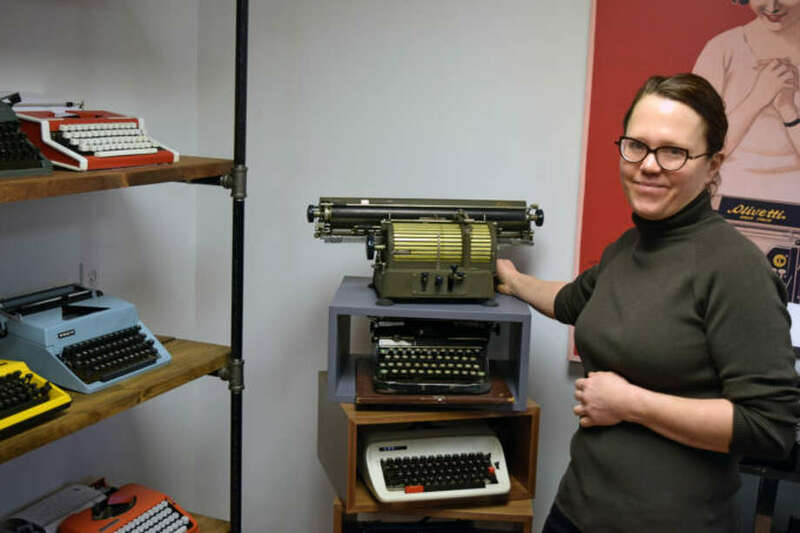 While her holiday offering of a vintage Underwood typewriter was not greeted with uncontrolled jubilation — “As a mom, nothing I can do is cool,” she added, with a laugh — her children’s friends were intrigued by the item. Kessler began collecting typewriters and offered to share them in school presentations, but not every young person understood the machine’s operations. Kessler soon found herself collecting typewriters for a hobby. Her collection grew a bit too much, and she needed to rent a storage space once her basement could no longer accommodate the harvest of her hobby. Then, an unexpected observation put her on the path to entrepreneurship. Kessler, who declined to discuss start-up costs, positioned Backspace Westport to serve several needs. Part of her operations involve the sale of the vintage machines, with prices ranging from $300 to $1,200 per typewriter. She explained that nearly all of the typewriters she acquired needed to be shipped off to specialists around the country that still offer repair services on these antiquated items. “They usually come covered in nicotine and filthy,” she said, adding that the costs of cleaning and fixing the machines are factored into their suggested retail price. Kessler envisions Backspace Westport as a new community destination for her town. She has an oversized Scrabble board mounted on a wall and a bag of large magnetic letter tiles, and she is hoping to start game nights for adults and children. She also set aside typewriters for people to rent, either on a $30-per-half-hour or $60-per-hour basis, but she admitted that her initial customers took an average of 15 minutes to figure out how to use the machine. Indeed, since her Feb. 2 soft opening, Kessler found many store visitors were surprised by what she presented. Kessler already has one famous booster for her endeavor: Academy Award-winning actor and fellow typewriter collector Tom Hanks sent Kessler a typewritten congratulatory note that she keeps on prominent display; Hanks’ documentary “California Typewriters” plays on a large-screen television in the store’s lobby. Looking ahead, Kessler is setting her grand opening event for June 23, also known as National Typewriter Day.